Almost five months have passed since UK nationals voted on whether Britain should stay in the European Union, but Brexit and the future relationship of the country with the EU has continued to make headlines since the result in June. At the Financial Times, editor-in-chief Lionel Barber wanted to encourage readers to contribute not just their opinions about Brexit, but also their solutions, in a way that was "productive and forward-looking", explained Lilah Raptopoulos, community manager at the FT. This was the goal behind The Future of Britain Project, an initiative launched on 19 October, calling for submissions that would help answer four of the most important questions about the referendum: what is the best relationship between Britain and the EU? ; what is the best model for the UK economy post Brexit? ; what is a good model for immigration in the UK? ; and what is the future of the European Union? The FT invited readers to pitch their ideas by filling out a form, providing a solution for one of the issues above. Each week for four weeks, the outlet published two 600-word opinion pieces featuring opposing views to the same question, one commissioned from the audience and the other written by an FT journalist or editor. "We saw this as a nice opportunity to crowdsource our readers, who obviously care and know a lot about this issue, towards a common goal, engage them in a deeper way and pull valuable insights out of them," Raptopoulos told Journalism.co.uk. "We have more than two million readers and among them are people making big and important decisions about business and politics every day, so we wanted to give people a chance to get their ideas in front of them." The form closed on 10 November, but almost 800 people submitted their ideas, some of which were recently published in an interactive on the website, where other FT readers can vote on them and share the ones they like best. Next, a panel of judges will choose one or two of the best submissions from each category and FT journalists will work with the authors to edit and refine their original pieces, which will be published on as op-eds on the website. The winners will also be invited to an event the organisation will be hosting about Brexit in January, alongside the paper's editor and columnists. The articles published as part of The Future of Britain are free to read – Raptopoulos said the decision to put the content in front of the paywall came down to the aim of reaching new audiences and engaging younger readers in particular. "We did have submissions from investment bankers, chief executive officers, business consultants and other people that you'd expect read the FT.
"But we also attracted ideas from a diverse range of readers: sixth form students, undergraduate and graduate students, an architect, a sculptor, a former immigration officer, for example. "This project and a lot of the projects we do is basically us directing our lens at the room." Since she took on the role of community manager in May, Raptopoulos has focused on using surveys and reader call-outs to get the audience more involved with the journalists. A recent survey asked FT readers who were EU citizens living in the UK how the referendum had affected them, and the more than 730 answers received led to a feature online and in print, highlighting data and personal stories people submitted. 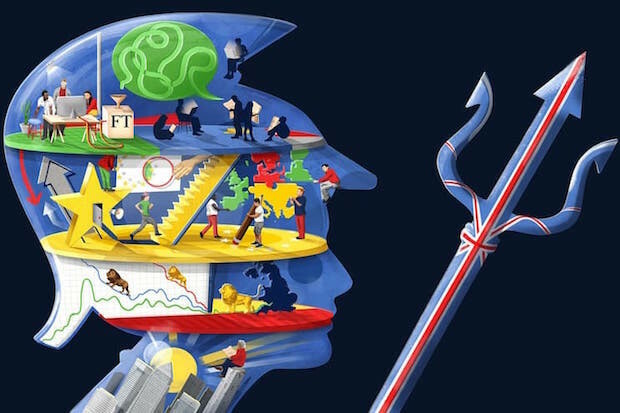 "[The Future of Britain] is the most wide-reaching call-out we've done, but we usually do surveys either because we want to know what the global FT readership thinks about an issue or to help answer the questions readers have around a topic. "The other thing we like to do and this project was a bigger example of this, is using call-outs to see what expertise our readers can share to help us find answers to difficult questions." The surveys are shared on social media platforms and distributed through the FT's various newsletters, as well as promoted in the body of individual stories. They also often lead to contributions that become pieces themselves. The other part of Raptopoulos' role has been to and to encourage "productive discourse" in online comments, which a team at the FT monitors constantly and post-moderates to "allow people to join the conversation more easily". For both the referendum and the US election, the FT published a "comments hub" the day prior to the vote, which would be monitored and updated with readers' thoughts throughout the day. "Creating a hub where it was clear that we were asking and listening really improved the quality of the comments that came out, because people had fuller ideas and thoughts, and they were more personal. "We believe in moderated comment sections and I think they are one of the most direct connections we have with our readers. "This is where they can discuss the story in a centralised place, where we can hear honest feedback, and where readers can develop a relationship with each other around our journalism," Raptopoulos said.